Sebastien Bellin was able to escape the first explosion during the terrorist attack at Brussels Airport on March 22 — but not the second. Though he survived the bombing, ballistic fragments hit his right hip, shattering his femur and hip joint. He sustained fractures to his right fibula and his left fibula was blown into fragments after the explosion demolished the bone. His left leg, nearly detached from the knee down, had several open wounds — some deep enough to expose bone. He lost 50 percent of his blood. “It was a rough time,” says Bellin, a 6-foot-9-inch basketball player who played at Oakland University in Michigan, as well as professionally, most recently for the Cercle d’Éducation Physique Fleurus club in Belgium. 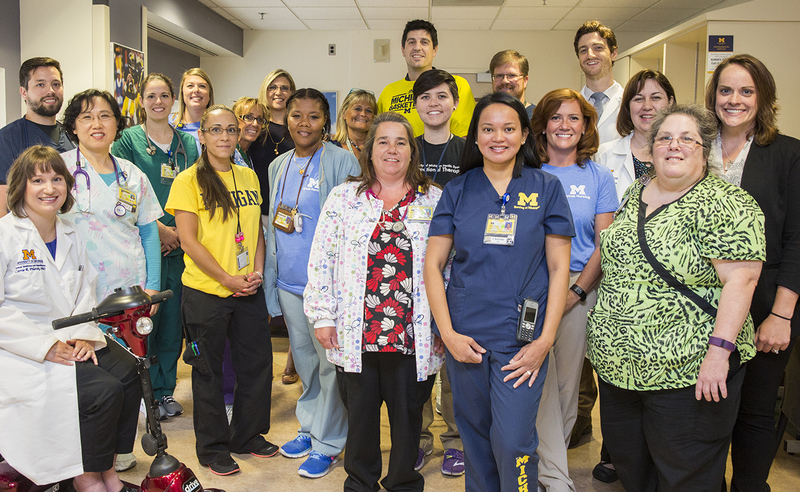 After six successful surgeries in Brussels, Bellin returned to the U.S. and chose to continue his recovery at the University of Michigan Inpatient Rehabilitation Unit. There, he would be closer to his home in Battle Creek, Michigan, where he lives with his wife and children, and benefit from what he felt would be a more proactive approach to rehab. Bellin says he found that “ideal combination” under the care of Sean Smith, M.D. (Residency 2013), a physician specializing in physical medicine and instructor at the U-M Medical School. Luckily, Bellin didn’t have any surgical complications, so his bones required only time and good nutrition to heal. Once tests validated that healing was taking place, the rehab team initiated a walking program for Bellin. He was doing weight-bearing exercises just 12 weeks after the explosion. Bellin’s story has received national media attention, including coverage on CNN, “CBS This Morning” and ESPN’s “Outside the Lines.” CBS also filmed a special two-hour “48 Hours” documentary about Bellin, which will air in mid-November and feature appearances by the U-M rehab team. The inpatient rehabilitation team includes medical doctors and residents, a physical therapist, an occupational therapist, rehabilitation nurses, orthotists, social workers, discharge planners, and rehabilitation psychologists. Because Bellin also suffered a concussion during the explosion, he was evaluated by the team’s speech language pathologist. For his part, Bellin is more than happy to share the spotlight.